Copyright 2018 International Freight Forwarders and Customs Brokers Association of New Orleans and Renaissance Publishing LLC. Postage Paid at New Orleans and additional entry offices. POSTMASTER: Send address changes to IFFCBANO, 1908 Clearview Parkway, Suite 203 Metairie, LA 70001. No part of this publication may be reproduced without the consent of the publisher. The opinions expressed in this publication are those of the authors and do not necessarily reflect the view of the magazine’s managers, owners or publisher. The Publisher is not responsible for unsolicited manuscripts, photos and artwork even if accompanied by a self addressed stamped envelope. In existence since 1913, IFFCBANO is a professional association comprised of licensed international freight forwarders, licensed custom brokers and transportation service providers located in the Southeastern United States with expertise in providing international transportation services nationwide. Working closely with all U.S. government agencies involved in international shipping the Association works to ensure the rights and interests of importers, exporters and members are protected. As an affiliate of the National Custom Brokers and Freight Forwarders Association (NCBFAA), our members work in conjunction with our national leaders in Washington to ensure the impact of new trade legislation on the trade community is positive. Actively promoting the advantages of shipping through the New Orleans area since 1988, IFFCBANO works in conjunction and coordination with regional trade associations and industry partners to develop new economic opportunities for the community and its membership. Working together to expand educational opportunities and trade development efforts, IFFCBANO and our member firms are poised to capitalize on the emerging opportunities in the Gulf region. We look forward to another year of servicing the international trade community and our membership. Dear Members and ColleaguesI cannot remember a year in recent history where Trade had been in the news so prominently. Where everyday people were using the term “tariffs” and the huge impact it has on the origin of the product. As we wait to see where 2019 takes us with trade agreements, cargo still moves around the world and seems to increase month after month. There are a number of other issues in our industry that have been brewing for a while — trucker shortage, railroad changes, port congestion — and we at IFFCBANO work together to inform our members and work with local and national groups to make meaningful change in our businesses. The 2018 State of the Port was a great success, and we learned of all of the advancements and achievements of the Port of New Orleans. From Cruise to Rail, Bulk to Container, cargo the port is growing in all areas and continues to be a dynamic element in the New Orleans economy. While those of us directly in the industry see these changes, the ability to communicate this story to the city at large is a great privilege for IFFCBANO. This year’s Symposium at the Grand Hotel in Point Clear, Alabama will have a new format — starting on Thursday with a Keynote Lunch and ending on Friday night as we install our new Board of Directors and celebrate our Honorary Life Member Bobby Landry,VP and Chief Commercial Officer for the Port of New Orleans. We are thrilled to invite you all to join us for these days of learning, networking and celebrating. I hope you will join us for the Symposium, State of the Port, and the various trainings and learning opportunities hosted by IFFCBANO. IFFCBANO is here as a resource to our local trade and transportation community, and we welcome your recommendations and insights as to how to serve this community more fully. Please enjoy this Directory as a resource, and I look forward to this year with you all. • Two members actively serve on the Louisiana Pilotage Fee Commission. 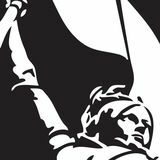 • One of fourteen nominating organizations that participate in the selection process for the Port of New Orleans Dock Board Commissioners. • Bi-monthly meetings are held with local U.S. Customs & Border Protection management fostering a solid working relationship. • Industry resource providing routine electronic updates regarding issues impacting the trade community on local, regional and national issues. • COMPLIMENTARY listing in the IFFCBANO annual directory. • IFFCBANO hosts the Annual Port of New Orleans State of the Port Luncheon in the fall. • Active members of the National Customs Brokers and Freight Forwarders Association (NCBFAA). NCBFAA engagement offers members national participation on trade related issues. • A nominating organization for the selection of the Annual C. Alvin Bertel Award. • IFFCBANO hosts an Annual International Trade Symposium bringing local & national industry leaders together to network & educate. • Monthly board meetings are held to address membership and industry concerns on a local and national level. 2019 Honorary Life Member Robert Landry Port of New Orleans The Honorary Life Member award is presented bi-annually to a person who has distinguished themselves by outstanding contributions, vision, leadership and dedication as demonstrated during their career in the promotion of international trade in the Gulf Coast region. The award will be presented during the International Trade Symposium, in Point Clear, Alabama, May 16-17, 2019. Join us at the Grand Hotel Golf Resort & Spa, Friday, May 17th, when we will celebrate Mr. Landry as our Honorary Life Award recipient. Register online at www.internationaltradesymposium.com. Annual Scholarship Awards The IFFCBANO Scholarships were awarded during the 32nd Annual Port of New Orleans State of the Port luncheon in October 2018. Students were recognized for their scholastic achievements. Our f irst place recipient, Lauren Trummel, attends the University of Florida and is working on a degree in Microbiology. Lauren is the daughter of John Trummel, Dole Food Company. Runner up Christian Hyde attends Tulane University and is working on a degree in International Relations. Accepting the award on his behalf was his mother Tatjana Hyde, D.B. Schenker. The Scholarship Award application, criteria and eligibility rules can be accessed online at www.iffcbano.org/Scholarships. Member Tatjana Hyde, D. B. Schenker, accepted the 2nd place award for her son Christian, from Donna Lemm, Secretary/Treasurer. May 16 – 17, 2019 For details visit our website internationaltradesymposium.com, email at iffcbano@bellsouth.net, or call (504) 779-5671. 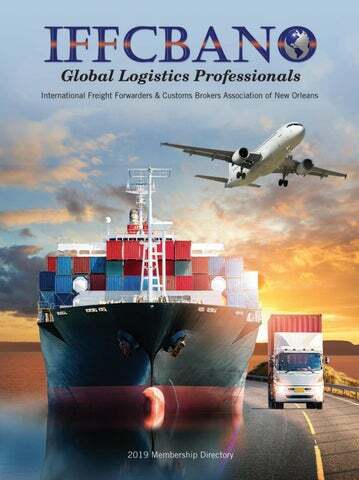 The International Freight Forwarders & Customs Brokers Association of New Orleans brings together top executives and decision makers to their Annual International Trade Symposium. The symposium is packed with educational and networking events and will provide you with the latest information on transportation trends. further increased volume is forecasted for 2019 and is expected to exceed 600,000 TEUs. For trade industry parties seeking to be part of that growth, IFFCBANO can serve as an invaluable network of resources. The new terminal for the New Orleans Airport will soon be open with a modern layout that facilitates international travel. The direct f lights to UK and Germany, have increased direct cargo imports and the future is bright on the export side as well. IFFCBANO has active representation within industry work groups such as the Port of New Orleans, the World Trade Center of New Orleans, the Port of South Louisiana, New Orleans Airport and the New Orleans Regional Planning Commission. Maintaining a strong relationship with these organizations ensures that our industry is well represented on transportation issues in the state of Louisiana. IFFCBANO continues to keep the focus on the horizon to see what opportunities may arise. 1. Israel FTA became effective August 19, 1985 2. The North America Free Trade Agreement (NAFTA) with Canada and Mexico became effective January 1, 1994 3. Jordan FTA became effective October 24, 2000 4. Chile FTA became effective January 1, 2004 5. Singapore FTA became effective January 1, 2004 6. Morocco FTA became effective June 15, 2004 7. Australia FTA became effective January 1, 2005 These cutting-edge agreements eliminate tariffs, tackle non-tariff barriers, open services markets, strengthen the intellectual property protections for our knowledge industries, and enhance labor and environmental protections. They level the playing field for U.S. businesses, increase choice and value for American consumers, and provide fresh momentum for open markets. 8. DR-CAFTA (Dominican Republic-Central America FTA) The agreement was signed May 29, 2004 and passed by both Houses of the U.S. Congress on July 27, 2005. Accession did not begin until each country changed its domestic laws to conform to the agreement. Countries were admitted into the agreement during the early months of 2006 in the following order: El Salvador, Honduras, Nicaragua, Guatemala and the Dominican Republic. Costa Rica’s participation was affirmed after an October 2007 countrywide plebiscite; and a further extension granted in order to finalize certain laws relating to monopolies in telecommunications and insurance before the U.S. Trade Representative could certify Costa Rica to the President. Such was accomplished in late 2008 and Costa Rica entered into DR-CAFTA as of January 1, 2009. The most recent previous renewal of TPA covered agreements reached between December 2002 and the end of June 2007. Current legislation would apply to agreements reached before July 1, 2018, with a possible extension to July 1, 2021. Legislation to reauthorize TPA was introduced, but not considered, in the 113th Congress. For successful negotiations, TPA allows the President to enter into reciprocal trade agreements and requires that legislation for implementing the agreement be considered on a defined timeline without amendments. In return, the President must keep Congress informed throughout the negotiations and abide by certain notification and consulting requirements. It improves the Administration’s position in the negotiations by ensuring the agreed-upon terms will be binding. Congress first gave the President the authority to enter into trade agreements in the 1970s. An annual piece of legislation that is passed by the US Congress to temporarily reduce or suspend tariffs on certain imported products and make technical corrections to US tariff laws. The legislation boosts the competitiveness of U.S. manufacturers by lowering the cost of imported inputs (some 600 tariff lines) without harming domestic firms that produce competing products. In addition, in the case of finished goods, MTBs similarly reduce costs for consumers where there is no domestic production and thus no impact on domestic firms. Overall, the tariff relief contained in MTBs is designed both to be broadly available to any entity that imports and pays duties pursuant to the specified tariff heading and to benefit downstream producers, purchasers, and consumers. This TPL matching arrangement has been one of the biggest successes of the DR-CAFTA. Because of flexibilities over the traditional yarn forward rule of origin, apparel production has increased in Nicaragua during the time the DR-CAFTA has been in effect. This program directly supports about 25 percent of all U.S apparel imports from that country, and indirectly supports much more through the sourcing arrangement. In addition, U.S fabric exports to Nicaragua have nearly doubled since DR-CAFTA took effect in 2006. U.S fabric exports to Nicaragua reached $110 million in 2011, and now account for about 10 percent of all fabric exports to the region (up from 3 percent in 2006). However, there was a certain amount of jealousy from the other DR-CAFTA partners for the Nicaragua TPL; so it is doubtful whether it will be ever reauthorized, even in reduced annual limits. • The U.S. currently has in place free trade agreements with 20 countries. Although the U.S. trade deficit is continually cited as a reason to throttle back on FTAs/TPAs, in fact, exports to these countries in manufactured goods, agricultural products and financial services have increased three fold, resulting in a healthy trade surplus, per U.S. Department of Commerce statistics. • Prior to implementation of the Dominican Republic-Central America Free Trade Agreement (DR-CAFTA), the U.S. was running an annual $1.7 billion trade deficit with the region. That has now morphed into a $1.8 billion trade surplus. • Under the NAFTA, if energy imports from Canada and Mexico are taken out of the equation (80% of the trade,) the U.S. is running a trade surplus with both countries in manufactured goods. It should be remembered that protectionism serves no one’s interests. The Tariff Act of 1930 (otherwise known as the SmootHawley Tariff), was signed into law on June 17, 1930 by President Herbert Hoover with the flourish of six gold pens, despite protests by over 1,000 economists (and noticed as a headline on the front page of the May 5, 1930 issue of the The New York Times). It raised U.S. tariffs on over 20,000 imported goods to record levels. The overall tariff levels were the second-highest in U.S. history, and the ensuing retaliatory tariffs by U.S. trading partners, reduced American exports and imports by more than half. bureau of industry & security guidelines In support of the safe and secure flow of international trade, the Bureau of Industry and Security (BIS) published the following guidelines to assist the trade community in achieving a high level of compliance with Export Administration Regulations. 2011 best practices for preventing unlawful diversion of U.S. dual-use items subject to the export administration regulations, particularly through transshipment trade Best Practice No. 1 - Companies should pay heightened attention to the Red Flag Indicators on the BIS Website and communicate any red flags to all divisions, branches, etc., particularly when an exporter denies a buyer’s order or a freight forwarder declines to provide export services for dual-use items. Best Practice No. 2 - Exporters/Re-exporters should seek to utilize only those Trade Facilitators/Freight Forwarders that administer sound export management and compliance programs which include best practices for transshipment. Best Practice No. 3 - Companies should “Know” their foreign customers by obtaining detailed information on the bona fides (credentials) of their customer to measure the risk of diversion. Specifically, companies should obtain information about their customers that enables them to protect dual-use items from diversion, especially when the foreign customer is a broker, trading company or distribution center. Best Practice No. 4 - Companies should avoid routed export transactions when exporting and facilitating the movement of dual-use items Best Practice No. 5 - When the Destination Control Statement (DCS) is required, the Exporter should provide the appropriate Export Control Classification Number (ECCN) and the final destination where the item(s) are intended to be used, for each export to the end-user and, where relevant, to the ultimate consignee. For exports that do not require the DCS, other classification information (EAR99) and the final destination should be communicated on bills of lading, air waybills, buyer/seller contracts and other commercial documentation. For reexporters of controlled and uncontrolled items, the same classification and destination specific information should be communicated on export documentation as well. Best Practice No. 6 - An Exporter/Re-exporter should provide the ECCN or the EAR99 classification to freight forwarders, and should report in AES the ECCN or the EAR99 classifications for all export transactions, including “No License Required” designation certifying that no license is required. Best Practice No. 7 - Companies should use information technology to the maximum extent feasible to augment “know your customer” and other due-diligence measures in combating the threats of diversion and increase confidence that shipments will reach authorized end-users for authorized end-uses. unless a long standing and trustworthy relationship has been built among the exporter, the foreign principal party in interest (FPPI), and the FPPI’s U.S. agent If you have reason to believe a violation is taking place or has occurred, you may report it to the Department of Commerce by calling its 24-hour ho line number: (800) 424-2980. • The customer or its address is similar to one of the parties found on the Commerce Department’s [BIS’s] list of denied persons. • The customer or purchasing agent is reluctant to offer information about the end-use of the item. • The product’s capabilities do not fit the buyer’s line of business, such as an order for sophisticated computers for a small bakery. • The item ordered is incompatible with the technical level of the country to which it is being shipped, such as semiconductor manufacturing equipment being shipped to a country that has no electronics industry. • The customer is willing to pay cash for a very expensive item when the terms of sale would normally call for financing. • The customer has little or no business background. • The customer is unfamiliar with the product’s performance characteristics but still wants the product. • Routine installation, training, or mainte	nance services are declined by the customer. • Delivery dates are vague, or deliveries are planned for out of the way destinations. • A freight forwarding firm is listed as the product’s final destination. • The shipping route is abnormal for the product and destination. • Packaging is inconsistent with the stated method of shipment or destination.When questioned, the buyer is evasive and especially unclear about whether the purchased product is for domestic use, for export, or for re-export.